Dizzy Recap: The Holiday Spirits Bazaar! The Dizzy Fizz rang in the holiday season with a bangin', boozy bash -- the first-ever Holiday Spirits Bazaar! From gravity-defying aerial dancers to an antique truck parked inside to endless amounts of holiday punches and cocktails, this was truly one spectacular affair. Thanks to everyone who made their way to The Green Building in Carroll Gardens, Brooklyn, and helped raise nearly $1,000 for the Museum of the American Cocktail. Let's do it again next year! A huge thanks to the Sponsors: Denizen Rum, Auchentoshan Single Malt Scotch, Tempus Fugit Spirits, Vermont Gold & White Vodka, Cockspur Rum, Classic & Vintage Spirits, Purity Vodka, Square One Organic Spirits, Haus Alpenz, FAIR Trade Spirits, Scorpion Mezcal, Redemption Rye, Don Q Rum, Hudson Whiskey, Solerno Blood Orange Liqueur, Pipeline Brands, Highland Park Single Malt Scotch, Chairman's Reserve Rum, Castries Peanut Creme Liqueur, Pasternak Wines and Innis & Gunn Cask-Aged Beer. As well as the Vendors: Fette Sau BBQ, SkimKim Foods, Emily Thompson Flowers, Kara Newman, Jesse Tobin and Elisabeth Prescott. Special thanks to: The Green Building staff, John Pomeroy, Damien Good, DJ TomasMoves, John Walder, Leo Borovskiy, Callie Peck, Libby Gowen, Anne Louis Marquis, Tina Tassels, Mary Elizabeth Van Hagen, Carmen Operetta, Sara Gorelick, Sharon Festinger, Elke Swakhammer, Matt Sparacino, Drink Up NY, The Summit Bar, WTF Coffee, Martin Pham, and Jill & Dale DeGroff. For more photos, please visit the Facebook pages for The Dizzy Fizz and Lush Life Productions. Want recipes from the event? Click here. Dizzy Recap: The Dizzy Fizz Holiday Puncheon! Blessed stuff indeed, and thanks to all who made The Dizzy Fizz Holiday Puncheon an unforgettable evening! On Sunday December 20, 2009, I was pleased as punch to ring in the holidays in style with a plaid-fashioned punch party at The Summit Bar, 133 Avenue C. This invite-only event gathered more than 100 of the city’s top mixologists and bar industry professionals, cocktail bloggers, lovely friends, as well as some internationally-recognized master mixologists. The Puncheon not only celebrated the holiday season, but was also my way of toasting the six-month mark for TheDizzyFizz.com as I approached 20,000 views--thanks for your support! 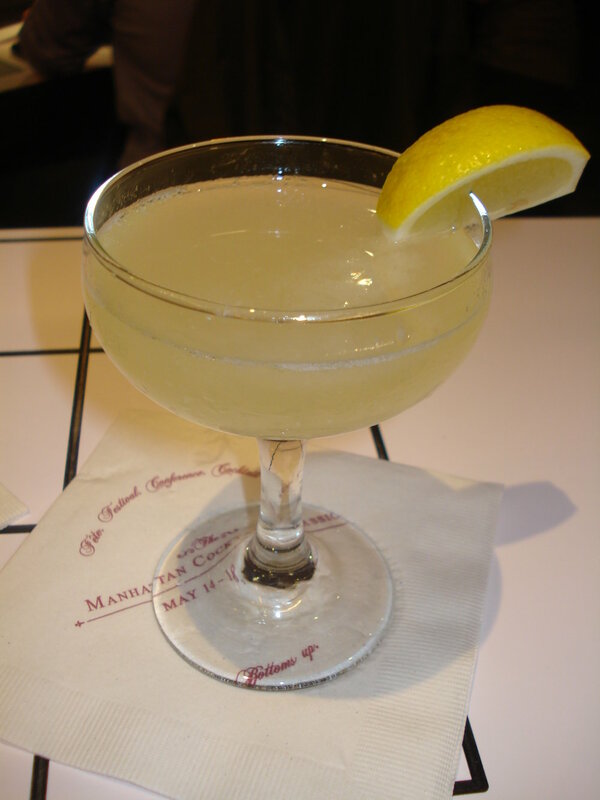 The Puncheon, named for the speakeasy that preceded the '21' Club some 80 years ago, featured seven punches created by members of the USBGNY (United States Bartending Guild of New York), LUPECNYC (NYC Chapter of the Ladies United for the Preservation of Endangered Cocktails), and The Summit Bar’s staff. Punches featured sponsored ingredients including: Plymouth Gin, Bols Genever, Ron Zacapa 23 Aged Rum, Bulleit Bourbon, Partida Tequila, Yamazaki Single Malt Whisky, 10 Cane Rum, Martini & Rossi Prosecco, Gran Marnier Liqueur, Bärenjäger Honey Liqueur, Benedictine Liqueur, Chartreuse, and Averna Sambuca Agrumi. Author/illustrator Jill DeGroff, and her husband, master mixologist Dale “King Cocktail” DeGroff, were featured guests. Jill DeGroff signed copies of her new book, “Lush Life: Portraits from Behind the Bar,” for party guests, courtesy of Chartreuse. Brian Van Flandern, a Michelin three-star mixologist, consultant to Chef Thomas Keller of Per Se, and author of “Vintage Cocktails,” and John Myers, cocktail historian, mixologist, and author of the upcoming "What Would Jesus Drink: Cocktails for the Second Coming" were also in attendance. 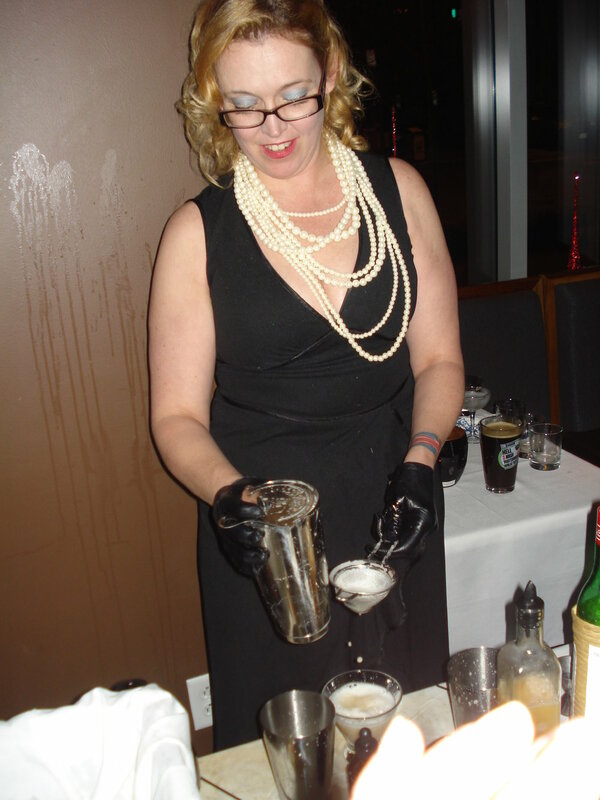 LUPEC bartender Jane Elkins’ punch, “The Redhead,” won the most applause and bragging rights as the crowd favorite. The punch included sage-infused Barenjager Honey Liqueur, Yamazaki 12 Year Whisky, Bulleit Bourbon, rooibos tea, ginger syrup, grapefruit juice, lemon juice, and Fee Bros. Whiskey Barrel-Aged Bitters. For the complete list of recipes, see the "Events" page. I can't thank the participating bartenders enough: Greg Seider of The Summit Bar, Frank Cisneros of Bar Celona and Prime Meats (USBGNY), John Pomeroy of The Hideout (USBGNY), Jane Elkins of Rye House (LUPEC), Lynnette Marrero of Rye House (LUPEC), Elayne Duke, mixologist for Diageo (LUPEC), Kelley Slagle of Hearth (LUPEC), and Katie Darling of White Star (LUPEC). Special thanks to Jill and Dale DeGroff for driving through the snow to make the event, to Katie Darling and Tal Nadari of Bols Genever for letting us use their gorgeous punch bowls, to Lush Life Productions for their amazing photography (see the full reel here!) and for providing the yummy cheese and fruit platters, to Hamid Rashidzada of The Summit Bar for organizing an extremely professional staff, to my lovely door host, Chaya Wilkins, and to everyone who made it out on a cold Sunday night--I know you all could have just stayed home in your PJs. Thanks for getting punched in the mouth with me, let's do it again soon! 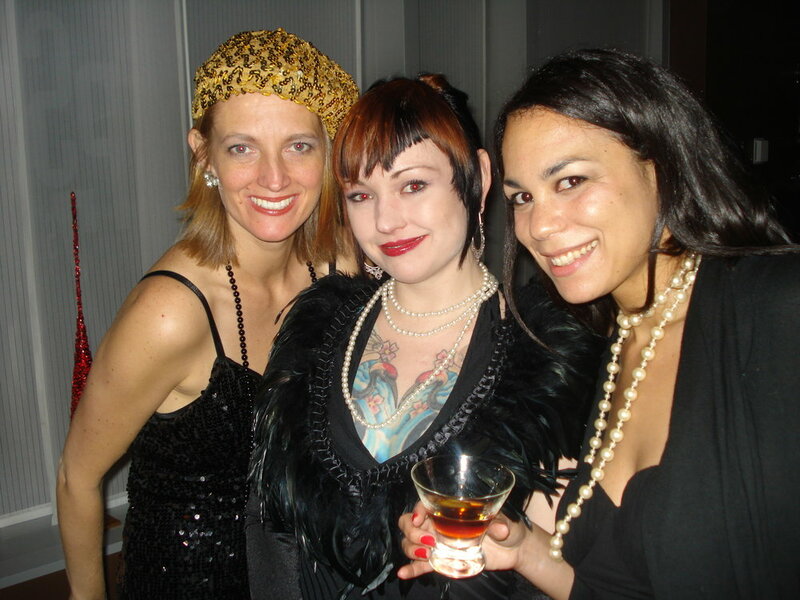 Dizzy Recap: 2nd Annual Repeal Day Ball in D.C. I scrambled to find the right dress for the swank black-tie affair, hopped into the LushLifeMobile with Lindsey Johnson, Leo Borovskiy, and Jason Littrell, and away we were, braving the first blizzard of the season to get to our nation's capital in time so that we could document it for the Museum of the American Cocktail. Being part of the press crew meant that we got to attend the event from the pre-opening stage, watching as the PS7's crew impressively pulled together all of the necessary details for the gala, all the way to the after-party at brand new bar The Passenger. Let's just say I got a little *dizzy* towards the end, although it was nothing too serious or worth calling my parents about. PS7's bar manager, Gina Chersevani, chef/owner Peter Smith, along with the D.C. Craft Bartender's Guild, showed all of us New Yorkers who made the trip that the District truly knows how to let loose 1933-style. From the magnificent punches, egg nogs, and classic cocktails served by all-star bartenders, to the red-and-black sequined ladies in pearls and feathers and the gents in suits, bowties, and a few sporting real (and some costume) mustaches, to the swingin' jazz band, Red Hot Rhythm Chiefs, D.C.'s 76th anniversary of the end of Prohibition was a knockout soiree. The "toastmaster" of the ball, mixologist and blogger Jeffrey Morgenthaler, bar manager at Clyde Common in Portland, Ore., has made it his ongoing mission to have Repeal Day recognized as a national holiday for years now, so he was the choice host. He kept us all entertained with drinking quotes from renowned cocktailians who couldn't make it, such as Dave Wondrich and Gaz Regan, as well as historical quotes and more tawdry quips from the crowd. Derek Brown, Dan Searing, and Owen Thompson of the D.C. Craft Bartender's Guild dressed up as the Founding Fathers, which added some revolutionary spirit to the occasion (as in, "Spirit of '76"). King Cocktail, Dale DeGroff, served the "Cocktel Jerez" (Jameson Irish Whiskey, Lustau PX Sherry, Lustau Dry Oloroso Sherry, Angostura Bitters, flamed orange peel) from the heart of the kitchen, which I found especially charming. His queen, Jill DeGroff, signed copies of her whimsical, soulfully-illustrated tome of bartender and musician caricatures and colorful stories, "The Lush Life: Portraits from the Bar," which was just released in time for the gift-giving season. Ed Hamilton, founder of Ministry of Rum, mixed ti' punches made with 100-proof rum straight from Martinique, sugarcane syrup (which you must try if you haven't yet, and can purchase here), and a small squeeze of lime, mixed with a swizzle stick. The Tippling Bros' Tad Carducci made a cheerfully-garnished "Gussied-Up Bread Line" (Averna Amaro, G'Vine Floraison Gin, fresh lemon, ginger beer, cranberries). Todd Thrasher (how cool is that name), mixologist at PX in Alexandria, Va., crafted a "Veritas" (Benedictine, Laird's Applejack, homemade apple bitters, walnut water, fermented apple, cider air) which I had two of and was as amazing-tasting as it sounds. Adam Bernbach of D.C.'s Proof delivered a unique and impressive hot drink, the "Pisco in Winter" (butter-infused Macchu Pisco, citrus-spice syrup, and hot water, garnished with an Angostura-cinnamon marhsmallow, yum). Rachel Sergi of Againn meticulously strained the "Thank U-Tah," (Tres Generaciones Anejo Tequila, Luxardo Maraschino, Leopold Bros. Three Pins Alpine Herbal Liqueur, fresh lemon, lime, orange, and grapefruit, egg, cinnamon tincture, and Fee Bros. Aztec Chocolate Bitters--whew) into a frothy flip. 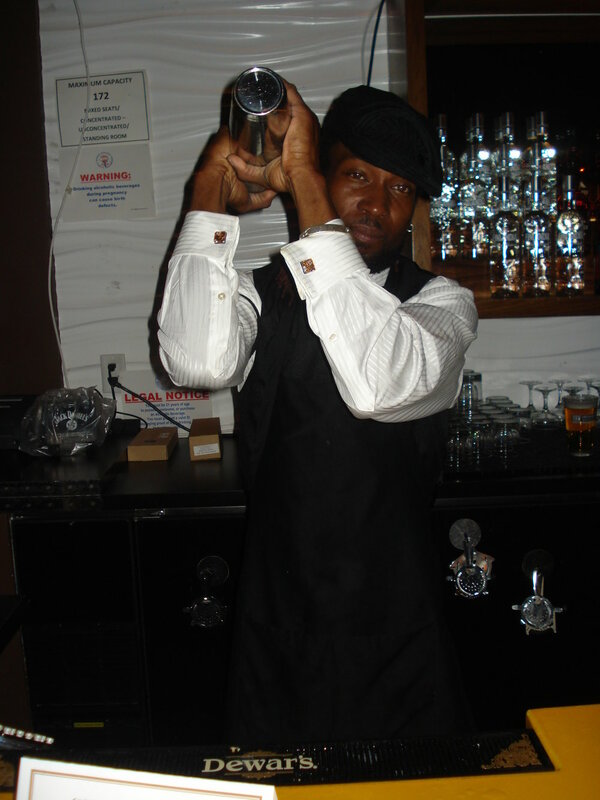 Philadelphia's Christian Gaal, bartender at Apothecary and Noble American Cookery, shook up some drinks as well, and there were other punches and nogs and delightful-looking things that I wanted to try, but as you can imagine, water eventually became a necessity. By the time we sauced revelers arrived at The Passenger, which mixologists and brothers Derek and Tom Brown opened late last month, it was bustling with an already-packed crowd and the scene was in full swing. I had a punch that included dangerously good ingredients I can no longer remember, champagne spiked with rum, and a most refreshing dark beer, the Butternuts Moo Thunder Stout, which had notes of espresso and malty goodness. 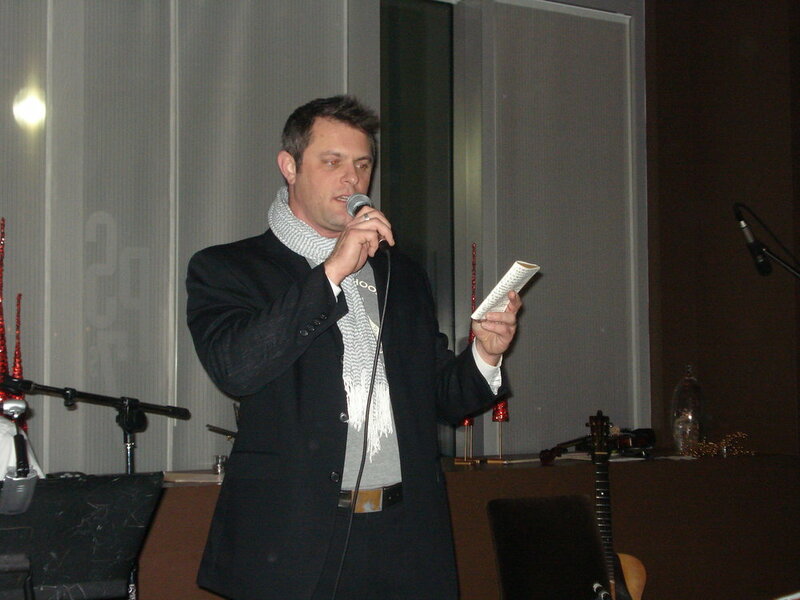 Oh, and the company was great--met Marshall Fawley of Scofflaw's Den and made lots of new D.C. friends. Let's just say it's a good thing that D.C. bars close at 2 a.m. because I'm not sure some of us (myself included) needed to continue riding the express train to Overindulgence. I must apologize for not writing down the food menu that was offered, but every hors d'oeuvre and appetizer I tried melted in my mouth, and I hope to check out PS7's dinner menu next time I'm in D.C. After doing a little post-event research, I discovered that PS7's is across from the historic first meeting place of the Anti-Saloon League, which launched the crusade for Prohibition. For more photos, check out The Washingtonian, keep an eye out for We Shoot Cocktails photos coming soon here, and if you're friends with us on Facebook: there will soon be a few extras in my album, be sure to scope the lovely Lush Life Production's album (and video here), and for shots of more NYC-D.C. love and Sunday's bartender brunch, check out Jason's snap-happy album--he stuck around D.C. longer than the rest of us. Most of all thanks to Lush Life, Dale and Jill DeGroff, and all of the amazing D.C. bottlerockers. Repeal Day is the bartender's holiday, and I was honored to celebrate it with some of the best in the country. Hope to see you again next year! Tomorrow is the 76th anniversary of Repeal Day, the day that Prohibition ended in 1933 with the 36th vote from Utah (yes, Utah) to repeal the 18th Amendment. For cocktailians, it's an actual holiday, a day to raise a glass and toast our freedom to drink in places other than speakeasies. Many NYC bar industry types are headed to Washington, D.C., where a 2nd Annual Repeal Day Ball is being put on by the D.C. Craft Bartenders Guild at PS7. Tickets for the black-tie event start at $100, and guests will get to clink glasses with Dale DeGroff and Portland, Ore., mixologist Jeffrey Morgenthaler. If you're going, head down early for author Garrett Peck's Temperance Tour, which visits all of the Prohibition-related sites in the capital. Garrett knows his stuff--his book, The Prohibition Hangover, is a thoroughly-researched look at how America's attitude towards drinking has changed from the days of the Anti-Saloon League to today's $189 billion drinking culture. I sat down with Garrett last month when I was in D.C. for a drink at Bourbon, and we chatted about his writing process. Garrett got the idea for his book during Christmas of 2003, when he opened a bottle of burgundy to drink with his mother and grandmother. His grandmother, born in 1913, was of a generation that still stigmatized alcohol use, and she refused to have a sip. Meanwhile, Garrett and his mother are both social drinkers and collect wine. This got Garrett thinking about the shift in cultural mores towards acceptance of alcohol following Repeal. Since all of the alcohol industry lobby groups are in D.C., Garrett was able to interview industry insiders and activists, as well as research historical legal documents. He also traveled across the country, from California wine country to the Kentucky Bourbon Trail to craft beer breweries in Pennsylvania and New England, among other boozy locales. Garrett finds that while two-thirds of Americans drink, the debate over how much to drink and at what age to start drinking is still a hot issue. You'll have to read the book for yourself to hear Garrett's arguments for lowering the drinking age to 18 to combat binge drinking, and make your own conclusions. Garrett's Temperance Tour starts at noon at the Cogswell Temperance Fountain at the Archives/Navy Memorial Metro station on the green/yellow line, and you'll need a Metro (subway) card. The tour should finish by 3 p.m., so you'll have plenty of time to get dolled up for the ball that evening, or grab an early drink and start celebrating. While hordes of foodies went to burger bashes and stalked Rocco DiSpirito, my NYC Wine & Food Festival experience was much more liquid-oriented, as I mentioned previously. So in no change of pace I found my weekend booked with two seminars featuring spirits that, just a few years ago, were on opposite ends of the popularity spectrum--gin and tequila. At "Gin Joint" at 5 Ninth, Plymouth Gin Brand Ambassador Simon Ford admitted that when he first moved to New York from London, gin had a bad rap. "I'm sure many of us had a bad experience and got sick drinking it from our parents' liquor cabinet," he said. But now that less-junipery gins are on the market, gin is finally having a moment again, at least here in New York. After "cleansing" our palettes with French 75s (Beefeater Gin, lemon juice, simple syrup, Perrier Jouet Champagne), Simon took us through a tasting of six gins representing the history of the distilled juiper elixir traced back to monks in the 11th century. Naturally, we started with Bols Genever, based on the 19th-century recipe for Holland-style gin. Its subtly sweet, malty taste was a hit with British troops fighting in Holland against the Spanish in the Thirty Years' War, who dubbed it "Dutch Courage." So when the British appointed a Dutch king to the throne (King William of Orange) in 1689, the gin craze officially took off. By the mid-1700s, gin was so popular in England that 11 million gallons were being produced a year, and at that time the spirit was known as "mother's ruin" for its detrimental effects. Thankfully, the 1830s brought the invention of the coffee still, leading to the column distillation method for what is known as London dry gin. Next, we tried Beefeater, a classic London dry gin, which features notes of juniper, citrus, and angelica root, and Plymouth Gin, which is made in the town of Plymouth, England, and manages to balance juniper with citrus, spice, and floral notes. 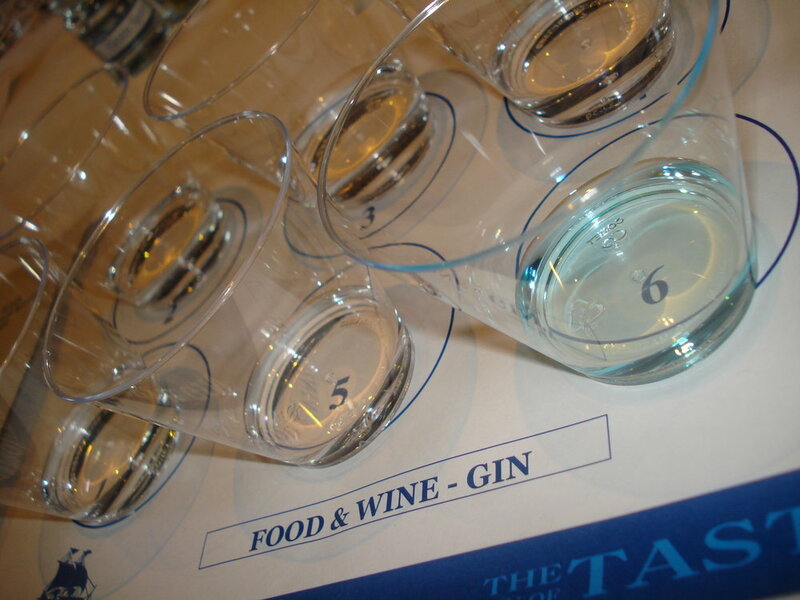 By the 1890s, the gin rage crossed the pond to the U.S., where it was a classic cocktail ingredient until Prohibition. We also tried Boodles, a classic London gin with juniper and coriander notes founded in 1762, Beefeater 24, a new gin released earlier this year with prominent citrus and tea notes, and Magellan Gin, which features a blue tint and floral nose due to its use of iris root. We were also served a dry martini (Plymouth Gin, dry vermouth, orange bitters, and a lemon twist) and a "Breakfast Martini," featuring Beefeater, Le Combier orange liqueur, lemon juice, and orange marmalade. The highlight of the session for me was chatting with Simon and Jamie Gordon afterwards and getting a sneak peek at Jill DeGroff's "Lush Life" book, a collection of her stunning caricatures of well-known cocktailians set for release on Nov. 1. Jill, wife of "King Cocktail" Dale DeGroff, has close ties with many of the people she illustrates, and her anthology captures the warmth and spirit of these animated "characters." For my last day of the NYCWFF, I attended a tequila tasting at Los Dados by Jaime Salas, National Brand Ambassador of Tres Generaciones Tequila, distilled by Sauza. A refreshing cocktail of Tres Generaciones plata, creme de cassis, ruby red grapefruit juice, and Sprite was served to prepare us for straight tastings of tequila, sans lime or salt. Jamie told us how blue agave, "maguey," was fermented and drunk by pre-Hispanic emperors before the Spanish distillation process was introduced in the 16th century. In 1873, Don Cenobio Sauza was the first to call the agave spirit "tequila," named after the region in the Jalisco state of Mexico, and the first to ship it to the U.S.
To be labeled tequila, the spirit must be at least twice-distilled, and it must come from the state of Jalisco and a few other areas. It must also have at least 51 percent of the fermented sugars come from the blue agave; the remainder may include cane or brown sugar, although this is considered less premium. Jamie said tequila is the costliest spirit to produce because agave takes eight to 12 years to ripen and then is harvested manually. Tres Generaciones is 100 percent blue agave and is triple-distilled, leaving smooth and clean agave flavors with a slight pepper finish. We tasted the plata, which is unaged (lightly sweet, citrus and banana notes); the reposado, aged four months in oak (vanilla, light caramel, and smoke); and the anejo, aged at least one year in toasted oak barrels (vanilla, toffee, and white pepper). Needless to say, this was not a bad way to start a Sunday afternoon. 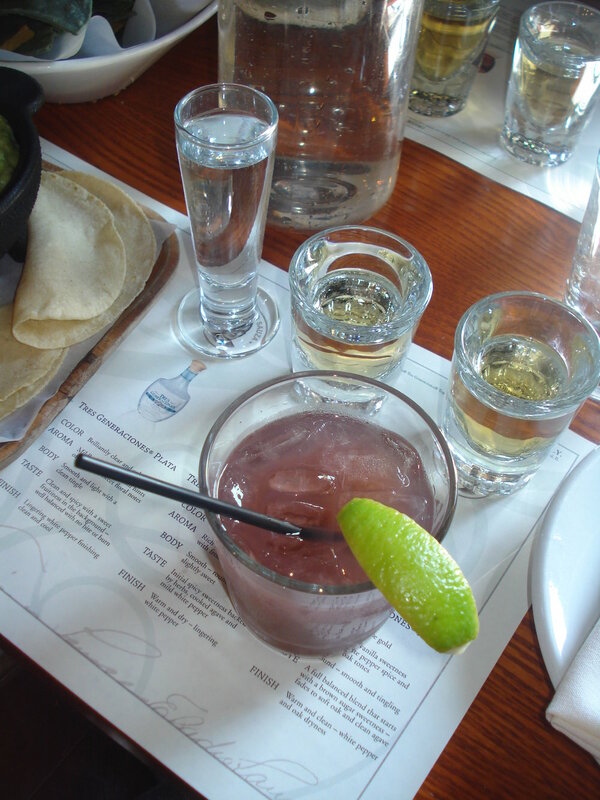 A few facts Jaime shared: chilling tequila suppresses the flavor; in 2007, the U.S. surpassed Mexico for tequila consumption; and the margarita is the most-requested cocktail in the world. Between birthdays and my first road race, it's taken me a hot minute to recap last week's World Cocktail Day fundraiser at Pranna, and I think my liver's still quaking. About 20 star mixologists and hundreds of thirsty followers celebrated the grand bittered sling in style. 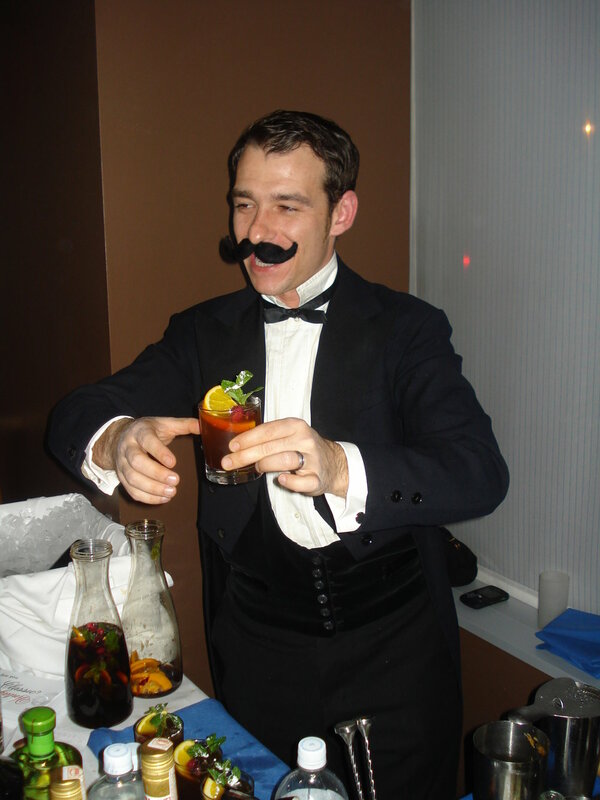 Invitees were ensured a dandy buzz as teams of five bottle-rockers served drinks each hour of the event. Some planned ahead and brought their own syrups, while others mixed drinks impromptu. Here's a rundown of the tipples I tasted: Gary Regan's Plymouth Pull (Plymouth Gin, Gran Marnier, Navan Vanilla Cognac, Angostura bitters), Simon Ford's blueberry cocktail (Plymouth Gin, Domaine de Canton ginger liqueur, muddled blueberries, lemon juice, simple syrup, sparkling sake), Jason Kosmas' Tom Collins (Plymouth Gin, lemon juice, aloe juice, simple syrup, soda water), John Lermayer's gin cocktail (Plymouth gin, muddled cucumber, ginger juice, lemongrass syrup, lime juice), Leo DeGroff's Jezebel (muddled strawberries, raspberries, and blueberries, Sagatiba cachaca, lemongrass syrup, honey, lime juice), Erin Williams' Cointreau Cup (Cointreau, muddled mint, cucumber and strawberries, Hendrick's gin, lime juice), Charlotte Voisey's Hendrick's Smash (Hendrick's Gin, Angostura bitters, mint, agave nectar, lime juice), Aisha Sharpe's tequila cocktail (El Tesoro Reposado Tequila, muddled pink peppercorns, Navan Vanilla Cognac, grapefruit juice, lemon juice), Misty Kalkofen's Tap Treasure (El Tesoro Reposado Tequila, maple syrup, Navan Vanilla Cognac, Angostura bitters, lemon juice), Julie Reiner's Clover Club (Hendrick's Gin, homemade raspberry syrup, dry vermouth, egg white, lemon juice), Audrey Saunder's Plymouth Mojito (Plymouth Gin, muddled mint, simple syrup, Pernod), Dale DeGroff's louched Pernod Absinthe, David Wondrich's adapted Old Fashioned (made with choice of Hennessy Black or 10 Cane Rum, Angostura bitters, dash simple syrup, lemon twist), Allen Katz's whiskey cocktail (Yamazaki 12 Year Single Malt, Domaine de Canton, Gary Regan's Orange Bitters, simple syrup, lime juice, sparkling sake), Gardner Dunn's whiskey cocktail (Yamazaki 12 Year Single Malt, tamarind syrup, agave nectar, lemon juice, ginger ale), Naren Young's Pisco Punch (Pisco, pineapple gum syrup, lime juice, lemon juice), and several others, including drinks by Ben Clemons, Andy Seymour, and Jamie Gordon, although my notes got a little illegible at that point. It was a fantastic evening in honor of the artistry and talent responsible for the cocktail renaissance. Check out my Flickr page for more photos by Bobbi Misick.